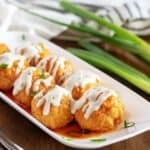 Slow cooker buffalo chicken meatballs are spicy, tangy, and simmered to perfection in a flavorful bath of buffalo sauce. Easy chicken meatballs and homemade buffalo sauce meet to make the perfect, bite-sized appetizer. In a slow cooker, combine the hot sauce, butter, white vinegar, Worcestershire sauce, garlic powder, and salt. Cook on high heat for 60 minutes, whisk ingredients together about halfway through the cooking process. Preheat oven to 350° Fahrenheit. Prepare a baking sheet by spraying it with cooking spraying or lining it with aluminum foil and placing a cooling rack on top. While sauce cooks, combine chicken, onion, garlic, Parmesan cheese, breadcrumbs, and egg in a large bowl. Use your hand or a spoon to combine the ingredients until well incorporated. Roll into meatballs the size of golf balls. Then, place the meatballs on the baking sheet. Bake for 25 minutes. Remove from the oven, and transfer the meatballs into the buffalo sauce. Turn the slow cooker to low, and simmer in buffalo sauce for additional 30 minutes. Remove from buffalo sauce and serve with ranch or bleu cheese dressing. Store any leftovers in a sealed container in the refrigerator for up to 3 days. *Calories listed are an approximate and are based on the ingredients and serving size listed (about 1.5-2 meatballs per serving). *See post for more in-depth information and tips about the recipe.